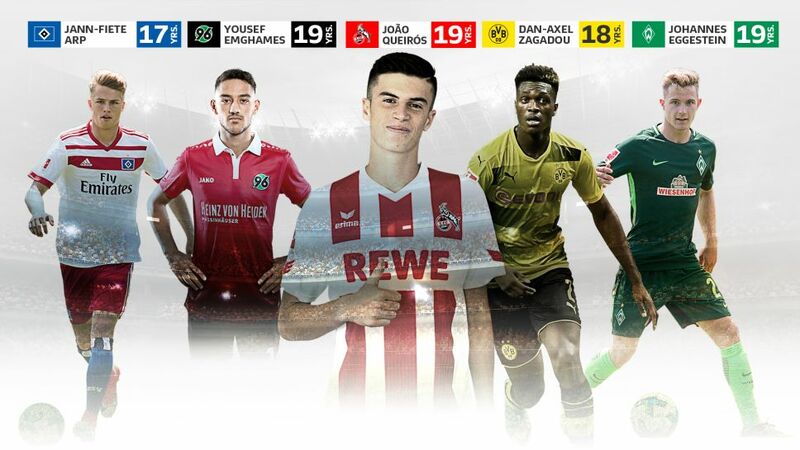 Arp, Emghames, Queiros, Zagadou and Eggestein (l-r.) are set to shine in the Bundesliga for many years to come. Yousef who…? Don't worry, you're not alone if this is the first you're hearing of him. Hannover have had their eye firmly trained on the attacking midfielder for a long time, however, and it represented something of a coup when they prised the 19-year-old away from Bayern in May 2017. Joao Queiros may not yet be as close to playing regular first-team football as some of his contemporaries here – he hasn't made his debut as a professional, after all – but that's not to say Cologne signed him from Braga this summer merely to make up the numbers. The centre-back is an accomplished defender and was a key member of the Portuguese club's U-19 side last season, and also did not miss a minute of Portugal's five games at the UEFA U-19 European Championship in Georgia. After signing him on a five-year deal valid until 2022, Billy Goats sporting director Jörg Schmadtke admitted they had been scouting him for some time with a view to integrating him into the first team: "Joao's a huge talent and will improve our squad defensively. We're confident that with the help of our coaching staff he can take the next step in his development and make the step up to the Bundesliga." If the surname has a familiar ring to it you're probably thinking of Maximilian Eggestein, Johannes' big brother and already an established member of the senior Werder Bremen side. Football definitely runs in the blood, however, as Johannes is well on the way to making a name for himself outright. A prolific scorer at youth level, where he scored almost as many goals as games he played, the striker underlined his blossoming reputation at the FIFA U-17 World Cup in 2015, scoring four times in four games for Germany en route to the Round of 16. Now a card-carrying member of the Bremen first team, Eggestein has the pace, movement and technique to match his keen eye for goal and he appears unfazed by making the step up to the pros, scoring an excellent goal in the Green-Whites' recent friendly 1-0 win over West Ham United. Remember that kid at school who was always better than everyone else? The one who seemingly (and unfairly) had divine gifts bestowed up them? In Germany, that kid is Jann-Fiete Arp. He is only 17 years old but already looks destined for the top, so much so that Hamburg have already signed him to a long-term contract. Arp scored two - yes two - hat-tricks at the UEFA European U-17 Championship over the summer, a feat never before accomplished, and finished as second top scorer with seven goals from five games. As if that were not enough, the striker won the prestigious Fritz Walter Award as the best U-17 player in Germany and trained with the senior Hamburg squad at their winter training camp in Dubai in January 2017. Arp still has plenty of time on his side, but he seems destined to hit the big time sooner rather than later. Baptisms of fire don't get much more intense than that experienced by Zagadou on his competitive debut for Borussia Dortmund. Injuries to a number of first-team regulars thrust the summer signing into the limelight against none other than Bayern in the Supercup at the beginning of August – not only that, he was asked to do so in an unfamiliar role at left-back. Click here to read Part IV, players 5-1!